This process creates 1,4-dioxane. For example, sodium laurel sulfate, a chemical that is harsh on the skin, is often converted to the less-harsh chemical sodium laureth sulfate (the “eth” denotes ethoxylation). The conversion process can lead to contamination of this ingredient with 1,4-dioxane. Other common ingredients that may be contaminated by 1,4-dioxane include PEG compounds and chemicals that include the clauses “xynol,” “ceteareth” and “oleth”. 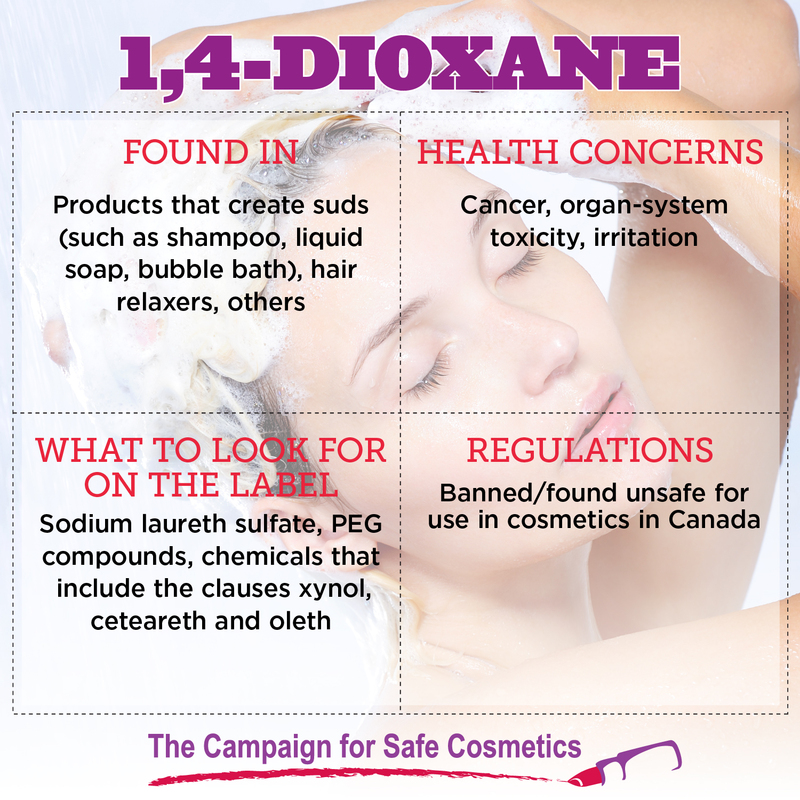 Most commonly, 1,4-dioxane is found in products that create suds, like shampoo, liquid soap and bubble bath. Environmental Working Group’s analysis suggests that 97 percent of hair relaxers, 57 percent of baby soaps and 22 percent of all products in Skin Deep may be contaminated with 1,4-dioxane . 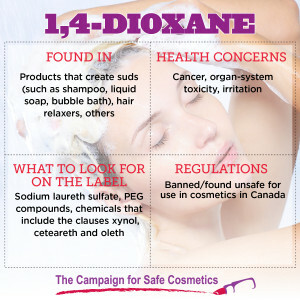 Independent lab tests co-released by the Campaign for Safe Cosmetics in 2007 showed that popular brands of children’s bubble bath and body wash contained 1,4-dioxane. Cancer: Research shows that 1,4-dioxane readily penetrates the skin . 1,4-dioxane is considered a probable human carcinogen by the U.S. Environmental Protection Agency  and is listed as an animal carcinogen by the National Toxicology Program . It is included on California’s Proposition 65 list of chemicals known or suspected to cause cancer or birth defects . HOW TO AVOID: The FDA does not require 1,4-dioxane to be listed as an ingredient on product labels because the chemical is a contaminant produced during manufacturing. Without labeling, there is no way to know for certain whether a product contains 1,4,-dioxane, making it difficult for consumers to avoid it. Alternative processes to ethoxylation do exist, but many companies don’t take advantage of them. Vacuum-stripping can remove 1,4-dioxane from an ethoxylated product, or manufacturers can skip ethoxylation entirely by using less-harsh ingredients to begin with . Organic standards do not allow ethoxylation at all, and some conventional companies, such as Johnson & Johnson, have agreed to alter the process that results in this contamination. A study by the Organic Consumers Association  shows that 1,4-dioxane is nonexistent in a variety of cosmetics certified under the USDA National Organic Program. Therefore a good way to avoid exposure to this chemical is to buy products that have been certified under this program. Additionally, consumers can avoid products that contain sodium laureth sulfate, PEG compounds, and chemicals that include the clauses xynol, ceteareth and oleth. Environmental Working Group (2007). Impurities of Concern in Personal Care Products. Available at www.cosmeticsdatabase.com/research/impurities.php. Accessed August 19, 2008. Environmental Protection Agency (2003). 1,4 Dioxane (CASRN 123-91-1). Integrated Risk Information System. Available at http://www.epa.gov/NCEA/iris/subst/0326.htm. Accessed August 19, 2008. National Toxicology Program (2005). Report on Carcinogens, 11th Edition; U.S. Department of Health and Human Services, Public Health Service, National Toxicology Program, January 2005. Available at http://ntp.niehs.nih.gov/ntp/roc/eleventh/profiles/s080diox.pdf. Accessed August 19, 2008. Office of Environmental Health Hazard Assessment (OEHAA) (2004). State of California Environmental Protection Agency. Chemicals known to the state to cause cancer or reproductive toxicity. Available at http://oehha.ca.gov/prop65/prop65_list/files/41604list.html. Accessed August 19, 2008. Environmental Working Group (2007). Impurities of Concern in Personal Care Products. Available at www.cosmeticsdatabase.com/research/impurities.php. Accessed July 28, 2008. Organic Consumers Association. Results of Testing for 1,4 Dioxane. Available at http://www.organicconsumers.org/bodycare/DioxaneResults08.cfm. Accessed August 19, 2008.